While it would be nice to think that everyone who works out does it for the vast array of mental and physical health benefits, the aesthetic payoff might be the strongest motivator. And no body part screams, “I work out!” louder than the arms. But you don’t have to quit your job and lift the heaviest weights in sight all day at the gym to improve your arms. 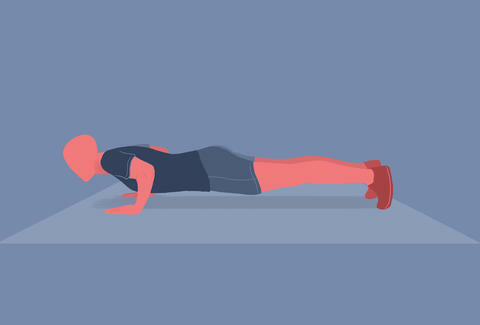 In fact, with these bodyweight exercises, you don’t have to pick up a weight at all. Here’s how: make sure your hands are a bit more narrow than shoulder width, and throughout the entire movement focus on keeping your elbows tucked into your side as much as possible. This helps place most of the emphasis on your triceps, instead of your chest and shoulders. If you’re really advanced, you can make it even more difficult by bringing your hands closer together. The best thing about dips is that they’re easily scaled to how strong you are. If you’re in peak shape and already relatively strong, then you can do them with your hands on a chair and feet propped up on something in front of you, so you’re using more of your bodyweight. Or you can get crazy and do them suspended between two bars. If you’re not quite to that level yet, that’s entirely OK. Just keep your feet on the floor, prop your arms up behind you, and focus on keeping your elbows as close as possible to you throughout the movement. You’ll start seeing improvements in no time. When it comes to building serious biceps there's probably not a better movement than chin-ups. They’re a great movement for hitting nearly the entire body, but especially the biceps, thanks to doing the movement with your palms facing you. But unassisted chin-ups aren’t for everyone, since they require a tremendous amount of upper body strength. Fortunately, there are plenty of other options. One of my favorites is the TRX row with your palms facing upward. This allows you to do a scaled-down version of the chin-up, while forcing your biceps to do plenty of work. If you don’t have a TRX or similar set up, using any fixed object that you can pull against works perfectly fine. One of the many beautiful things about bodyweight movements is that no matter how strong or skilled you are, you can always make them appropriate for your level. So if you’re finding any of these exercises too easy, try slowing down the movement, which will force your muscles to work harder. Tanner Baze is a writer and personal trainer who definitely did arms this morning. Follow him @dtbaze.